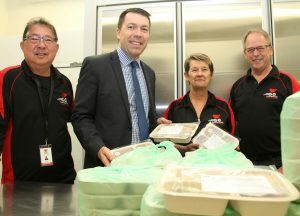 Awesome: Campbelltown mayor Cr George Brticevic with meals on Wheels volunteers (from left) Danny Torres, Debbie Jones and Patrick Duffield. It may be a cliché but it’s true nonetheless: time is one of the most valuable gifts any person can give to another. And that’s why every year, Campbelltown City Council celebrates the selfless contribution of thousands of volunteers to the community at the Gift of Time Awards. Nominations for this year’s awards have opened and members of the community are invited to put forward the names of community volunteers and organisations to ensure they receive the recognition that they deserve. Mayor of Campbelltown, Cr George Brticevic, said the city was fortunate to have so many community-minded locals. “Our volunteers come from diverse backgrounds, but have one thing in common, their selfless devotion to making our community a better place,” he said. “I never fail to be awed by the hard work and dedication of this marvellous group of people. “Our volunteers give their time in many different ways, including supporting hospital patients, advocating on behalf of war veterans and their families, raising funds for the less fortunate, supporting our young, disabled and elderly as well as caring for our bushland and assisting in our libraries. Nominations close on Monday, November 19.